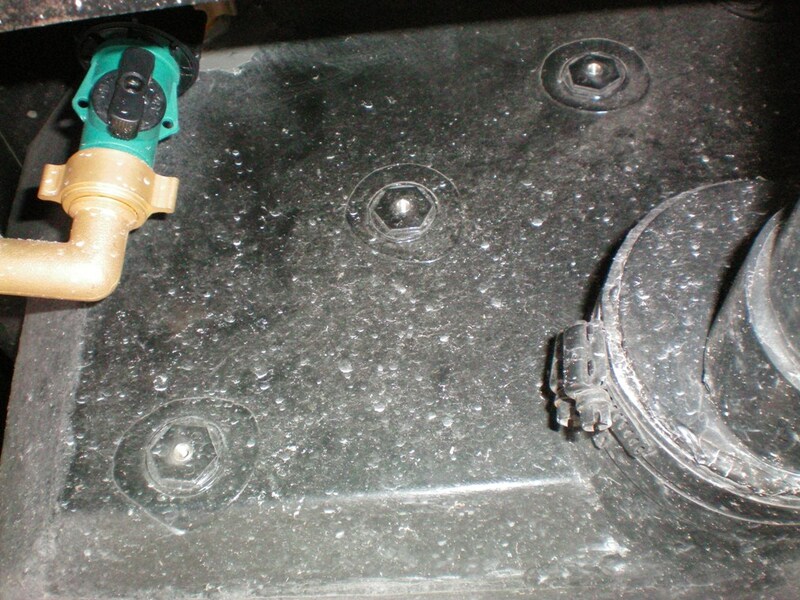 Could I see by a show of hands – How many of you are satisfied with the performance of your holding tank sensors? Anyone? OK, one guy in the back there – and I’m guessing your RV is brand new, right? Chances are, if the holding tanks on your RV have been used more than a few times, you’re probably getting false readings on your tank level monitor. The typical scenario is the black tank or grey tank level monitors still showing partially full, even after they have been emptied. While not a serious problem affecting the use of your rig, it can be inconvenient and very frustrating. So what causes this problem? The tank monitor system is a simple device that consists of usually 4 sensors mounted progressively up one side of the tank and connected to the indicator panel inside the coach. The bottom sensor is a negative lead and as the fluid level in the tank rises to each of the other sensors, it completes a circuit to light the corresponding indicator light on the panel. The false readings occur when something other than the fluid in the tank completes this circuit. It has been said that in the black tank, this can be a piece of toilet paper stuck to a sensor. Seemed odd to me that the same sensor kept catching a piece of paper, and why, then, do we get false readings in the grey tank? When I started getting false readings within a few months of purchasing my trailer, I went through a series of attempted solutions. It was worse on my grey tank and since my black tank had a flushing system, I installed one on the grey tank. I went through bottles of tank probe cleaners and gallons of Calgon, but nothing seemed to work for any length of time. After cleaning, the monitor would read correct for a trip or 2, but soon return to the inaccurate readings. I investigated some retrofit systems, but they were pricey and involved replacing everything including the monitor panel. Eventually I came across a reference on the internet to a product called Horst Miracle Probes. I went to their website and watched a video explaining the cause of the false readings and a demonstration of the product. Turns out there’s a sludge that builds up on the inside of the tanks and when damp, carries enough of a current to light the appropriate indicator and show a false tank level. The Horst Miracle Probe is designed to reach further into the tank and has a Teflon base to insulate it from the sludge. Additionally, the probes for the black tank are shielded, so that if a piece of debris actually does hang up on it, it can’t touch the probe. With these probes, you simply replace your original tank probes with the Horst probes, and use your existing wiring and monitor panel. The Horst Miracle Probes come in sets to match any tank configuration. My trailer has 1 grey tank and 1 black tank, so I ordered that set. Cost (with shipping) was 70 bucks and some change. As I started to install them, I first encountered one small problem. The Horst probes were not a direct replacement for the existing probes on my Rage’n. Additionally, a couple of the original probes on the black tank we so close to the frame rail of the trailer, there was no way I could get to them without dropping the tank. THAT was not an option! Instead, I decided to simply relocate the new sensors to the rear of the tank where I had easier access and leave the old ones in place. I drilled new holes in the rear of the tank, evenly spaced up the face of the tank. 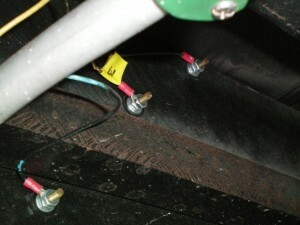 The probes go in and then tighten up with a compressed rubber gasket to form a tight seal. The probes for the black tank must be installed in the proper orientation, but they’re marked to easily accomplish this task I then cut the wires from the existing probes, being sure to tag and number each one, so I could replace them in the correct sequence. There was several extra feet of wire for each probe that was just balled up and tied to the frame, so this gave me the opportunity to clean up the factory wiring a bit. After installation, I tested the new system by filling the tanks with water and they read accurately. Once the tanks were drained, both tanks read – “EMPTY“. I knew, however, that it would take some time to see how they performed in real life. So, how have they performed? In a word – perfect. I installed these probes in December of ’09 and immediately afterward took the trailer to my cousin’s house for the Christmas / New Year’s holidays, exclusively using the holding tanks for about 2 weeks. In mid-January, I lived in the trailer for 19 days while working at a show, again with no sewer connection and strictly on the tanks. Following that I went to Daytona for 16 days, and the holding tanks were filled and pumped about every 3 days. In each of these instances, there was a lot of cooking and dishwashing, as well as daily showering, so the tanks got abused with sewage, grease, food debris and soap scum. The tank readings have always read accurately while the tanks are filling and return to an “empty” reading immediately after dumping or pumping. What more could you want? These Horst Miracle Probes are a very simple, effective, and inexpensive solution to a common source of frustration for RV owners. Check them out at www.horstmiracleprobes.com There’s a link to www.rvprobes.com where you can order them online. Thanks for sharing your experience. If we had better readings, my wife would probably be up for taking more road trips. I’m going to give them a go. Outstanding Write up, Might have to order me a set as well. Nice article, cool that it give you a fix to the problems with our tanks and gives us a general idea how the work. Figured I would give them a try and soon discovered-“They work”. No more guessing. Thank you Horst. How are your horst probes working? Cannot locate them anywhere. Are they still being manufactured? Any idea where I could find them?